It helps with their range of motion (ROM) for the day. It helps them concentrate on their breathing. It also helps with strengthening their muscles. 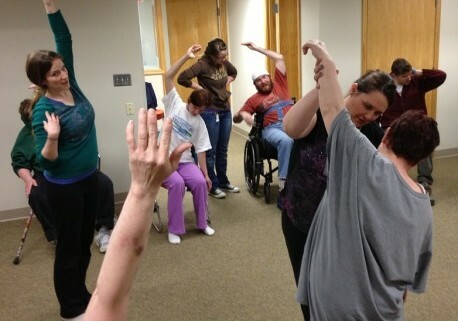 Tuesday, April 23, 2013 marked the first day of RSI’s chair yoga classes. These classes are adapted for all bodies, including those with limited mobility and physical disabilities. Classes have a non-intimidating, relaxing atmosphere filled with lots of laughter and smiling. First we get people sitting up well…… and then we get them breathing. Molly McManus, co-owner of Duluth’s premier yoga school, Yoga North, and Teri Sanders, of RSI and Yoga North teach the class. Both Molly and Teri received training on adapting yoga for physical disabilities by Matt Sanford at MindBody Solutions in Minnetonka, MN. First and foremost, we’d like to thank all of the people who come on Tuesdays from 4 – 5 pm to participate in the yoga classes – it is the clients who come that make it fun for us to share this gift of yoga! Also, big thanks to the staff that assist with getting the participants there and jumping in to give hands-on assistance while the class is going. We could not do it without these staff! Finally, we’d like to thank our donors, whose financial support helps to make this affordable to the people who participate. The following people and organizations have invested in helping to increase the wellness of members of our community.